(AGI) - Naples, Feb. 27 - Twenty-five people have been arrested by the Naples NAS carabinieri during an operation that has put a stop to an organization involved in rigging horse races. Horse owners, breeders, trainers, scientific consultants, pharmacists, veterinarians, jockeys and common criminals have all been taken into custody on warrants issued by the preliminary investigative judge of the Naples Tribunal. The charge is criminal association for receiving doping drugs used on horses involved in official and secret competitions. The investigation, coordinated by magistrates from the Naples public prosecutor's office, is the follow-up of the inquiry which, a year ago, led to the seizure of a secret race-course in the Neapolitan hinterland. The organization, which allegedly has no connection with the Camorra, was based in Naples and had offshoots in Sicily and Emilia Romagna. Investigations brought to light the group's use of doping drugs on the race horses of an unknown provenance (from theft, kidnappings or smuggling), interfering with the rules of the races and 'rigging' the results with illegal profits from betting. Details of the operation will be made known during a press conference this morning at the public prosecutor's office. (AGI) . Two vets and a pharmacist were among 24 people arrested by police in Naples yesterday over claims that they fed Viagra to horses running in illegal races to make them go faster. The arrests were part of a wider investigation into clandestine racing and betting in southern Italy. Police said horseowners and jockeys had also been arrested during the latest raids. Prosecutors in Naples have been trying to stamp out illegal horse racing, which takes place on public racecourses after hours and attracts hundreds of gamblers. Stolen horses are often used. Some are fed powdered Viagra or other stimulants to improve their performances. "The survey of 400 voters also found sharp disagreement over the casino's social and economic impact. "About 55 percent of those surveyed by The News said the casino will be good for the city. About 45 percent called it a bad idea. ONTARIO – As reported by the Hamilton Spectator: "Six Nations Chief David General believes the people will have to decide whether Internet gaming is a safe bet for Canada's most populous native reserve. "He said all members of the elected band council now agree the thorny question, which first surfaced three years ago, has to be determined by the voters themselves. "'The only way we can do it is by having a referendum,' General said at the band council offices yesterday. "He said the vote would probably be held within the year and would mean contacting all eligible voters among the 22,000 band members, only about half of whom live on the reserve outside Brantford. The others are scattered over Canada and the United States and in military units overseas. "And even if supporters win the vote, elected officials would have to deal with the implications of sanctioning an activity that's still illegal anywhere in Canada. "…Proponents of Internet gaming claimed it would create high-tech jobs on the reserve and bring in about $3 million a year in licensing fees for the band council. As far as the legality was concerned, they argued the reserve is a sovereign nation and not subject to Canadian laws. They pointed out that the Kahnawake reserve near Montreal allows Internet gaming -- the only jurisdiction in Canada that does -- and could act as a model for Six Nations. The authorities have never tried to close it down…"
television channel into the United Kingdom and Ireland." Any establishment that stands to gain financially by holding poker tournaments in Manitoba is breaking the current laws. 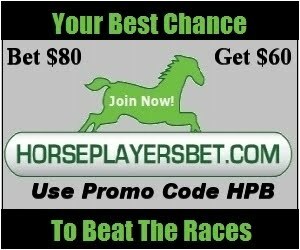 ALBANY, New York – As reported by the Albany Union-Times: "New York state could enjoy a more-than-$2 billion windfall if it sold its three thoroughbred racetracks and its interests in video lottery terminals and off-track betting to the highest bidders, according to a study set for release today. "That estimate is far above the roughly $450 million value put on New York's gambling assets by the Friends of New York Racing, a coalition of private racing and gambling interests that has sought to advise the state on how to handle an upcoming bid for the thoroughbred track franchise. "The new report -- from the Maryland Tax Education Foundation -- takes a different long-term view of racing in New York, suggesting that tracks and the racing industry should not get as large a cut of racino operations as FNYR proposed. It says there is no assurance the money will really help horse racing. "…It further suggests FNYR's estimate of the economic impact of horse racing was overblown. It estimates 7,000 jobs in the state are directly or indirectly related to the industry, compared with FNYR's figure of 35,000…"
The report says VLT licenses at Belmont Park and Aqueduct are worth $1.426 billion, while OTB operations could sell for $400 million. It says that Saratoga Race Course, Belmont, and Aqueduct are worth a combined $303 million. This $2.1 billion is about four times the amount the value of assets listed in a Friends of New York Racing report, Hooke said. He said selling the tracks, VLTs and OTB separately opens the process to a broader range of bidders, resulting in higher price tags for each component. The 2008 Pennsylvania Derby will go from a purse of $750,000 to $2,000,000 thanks to anticipated slot revenues. Can Racing Adapt to the New Realities of the Marketplace? 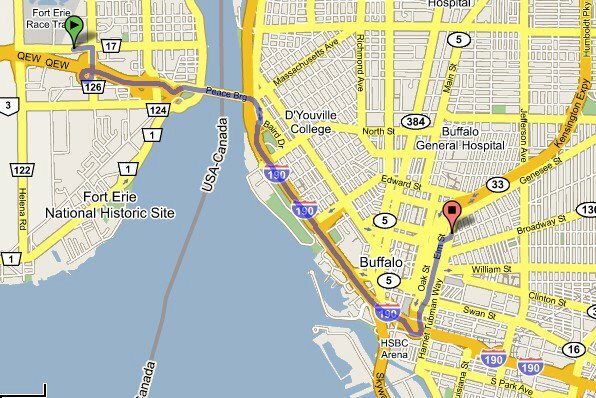 Proximity of proposed Buffalo casino to Fort Erie Racetrack and Slots(10km). BUFFALO, New York – As reported by the Buffalo News: "The Seneca Nation's bid for a Buffalo casino moved forward on two fronts Wednesday, with the tribe announcing that it had finished land acquisition and the state's highest court ending Cheektowaga's attempt to remain in the running for the project. "Seneca Nation President Barry E. Snyder Sr. clarified the tribe's plans for its Buffalo casino in a meeting with Rep. Brian M. Higgins, D-Buffalo, a day after the Court of Appeals issued its ruling. "In a news release, Snyder attempted to make clear that the tribe does not plan vast new land purchases in Western New York, even though its purchase practices indicate that might be possible. Meanwhile, the Court of Appeals dismissed Cheektowaga's request to hear a case that would have given the town a chance at the casino if the tribe's Buffalo plans fell through. The Senecas have asked the designers to come up with plans for a 100,000-square-foot casino with room for 2,200 slot machines, 50 gambling tables, a fine-dining restaurant, buffet and small retail shop. A 2,500-vehicle parking ramp and a casino operations center are also part of the project. The designers were asked to create a complex that could accommodate a future 250-room hotel with meeting rooms and banquet halls. Under their state gaming compact, the Senecas have until Dec. 9, 2007, to get their Buffalo casino up and running. They are also running 14 races on Wednesday nights, up from 12. Their 4 month meet will have 63 racing dates this year, up from 58 dates last year. However, available purse money per day will decrease from $79,000 to $75,000. The Italian government have announced that they are set to block 684 gambling websites by Friday in an attempt to stop the fraudulent acquisition of passwords and credit card information. Only websites licensed in Italy will not be affected. Those Italian ISPs who do not comply will be fined heavily. Companies like Betfair are considering legal action to fight this. Dates are decreasing from 187 last year to 156 this year, this freed up $2 million dollars in purse monies. This will increase the quality of racing at Thistle, and most likely increase the daily handles. They also expect an increased horse population, making for more competive quality races. Gamblers tend to bet more money on larger fields. This also makes it economically viable for the horse owner. It increases the owner's chance to make money. "Bookie IP" will soon be able to accept bets by registered clients on the internet. Besides horse racing, sports betting is expected to be handled by this system. Spokesman Jim Brinkhurst estimated construction of the proposed Wheat City Horse Park in Brandon, Manitoba will provide $27 million to Brandon in direct and indirect expenditures and annual economic impact of $10 million once the park is running. Revenues are expected to be 932 million for 2006-2007, and over 1 billion in 2009. Regardless, if passed, this will be like stopping pot smoking and prostitution. The USA might as well make money off online betting. Legalize it and let Vegas become the central house for now. Why let offshore companies make money that should stay in the States?